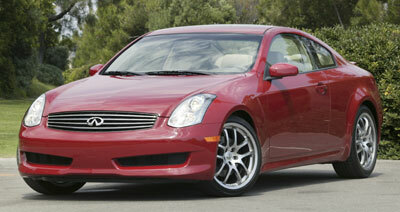 Infiniti's 2006 G35 Coupe offers balanced performance. A front-midship placement of the G35 coupe's V6 engine behind the front axle provides a 56:46 front-rear weight balance. Infiniti bundles its 2006 G35 Coupe into the ideal package for those wanting both a civilized daily driver and competent sports car. This two-door, rear-drive 2+2 is comfortable, powerful and nimble - offering a fun and confident driving experience. Buyers choose from two different Infiniti G35 Coupe models, the 3.5 liter v-6 automatic powertrain or the v-6 six speed manual powertrain. The difference between the two G35 coupes are the horsepower, 280 automatic vs. 298 for the manual. A front-midship engine placement provides a 54:46 front-to-rear weight balance. The test Infiniti G35 Coupe, base priced at $33,200, is fitted with the automatic transmission. A push on the shifter to the right slips it into manual mode. Light fore-to-aft taps efficiently execute up-and down-shifts. Performance is boosted on the G35 Coupe with a Sport-tuned Suspension Package, adding $1,600 to the price tag. This package upgrades the suspension with stiffer springs and shocks, and large-diameter stabilizer bars. Along with the beefier suspension, the package includes: five-spoke, 19 inch forged aluminum-alloy wheels; staggered-sized -P225/40R-19, front, and P245/40R-19, rear - Y-rated high performance tires; viscous limited-slip differential; sport front bumper and side sills; drilled aluminum pedals; and perforated leather steering wheel with orange stitching. The Infiniti G35 Coupe begs to be driven, coaxing you to look pass and blast through turns. It accelerates with great spirit, treating the senses with the added titillation of a throaty exhaust note. And the power kick doesn't let up, providing confident execution of freeway merges and lane switches in fast moving traffic. Estimated zero-to-60mph times are in the low-6 second range with the automatic and mid to high-5 second range with the manual. Agility is another strong point. Complementing the stick-to-the-road capability of the taut suspension is steering deserving of all the superlatives one can throw at it. There's a positive on-center steering feel, and the car responds to the slightest turn of the wheel. A $750 Infiniti Rear Active Steer system is available that features motor-drive control. Infiniti reports it improves handling performance by adjusting rear suspension geometry according to steering input and vehicle speed. Most surprising is that despite the taut suspension and low-profile tires, ride quality is excellent. The suspension does well at isolating minor road irregularities. While the ride stays smooth, tires- under certain irregular pavement conditions - can transmit noise into cabin,. The Infiniti G35 Coupe has above average front seats team with the suspension to provide comfortable cruising. Fitting for this dual-personality coupe, the front seats have a best-of-both-worlds character. They both pamper and provide aggressive, sports-car-like side bolstering. Both front seats are heated, with the driver's seat offering 8-way adjustability and the passenger seat providing four-way adjustability. Leather upholstery on the Infiniti G35 Coupe is standard and front backrests are embossed with Infiniti logos. 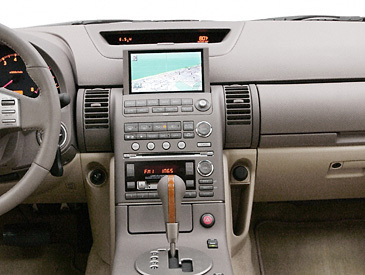 The dashboard and instrument cluster design is elegant and brushed-metal-trimmed, double-tiered dash has a smaller, recessed top level creating a handsome unit that doesn't encroach on occupant space.